It's peak rhubarb season in our yard, right now. I have so much rhubarb that I have extra to freeze and dehydrate. 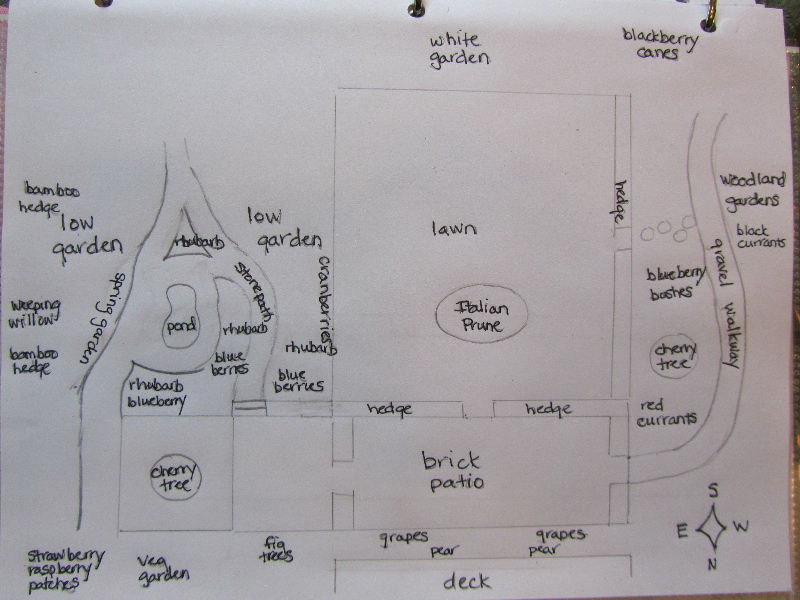 Last winter a couple of you indicated that you'd like to see a sketch of the layout of our gardens. I set out to do that yesterday morning. So, here's the first preliminary sketch. It's not to scale. (The lawn is not nearly so square -- oops!) But fairly representative of the layout. I have a set amount of time I can devote to working on my blog and reading other blogs, so sketching this out without a measuring tape was the quick way. I like to think of the different sections of our yard as rooms, each with its own personality, use and decor. 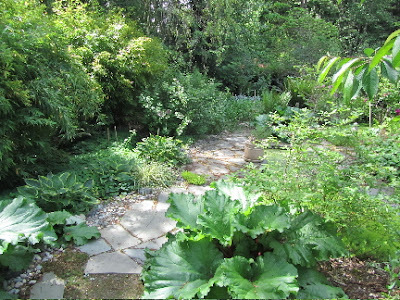 The west side of the low garden receives the most sun. I have 3 blueberry bushes and the 3 largest rhubarb plants at the north end of this section. I grow mints in the shade of one of the blueberries. I have large pots sunk into the ground for the mints, to control rampant spread. 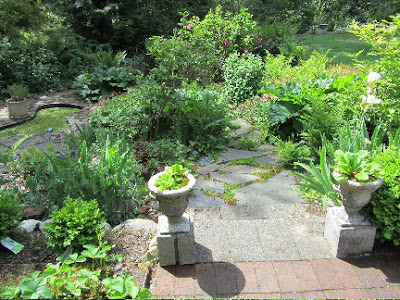 The stone path winds down to the pond and my tea garden, where my I have some lavender, chamomile, and lemon balm. From the other side of the cherry tree is a stone path (still under construction) that meets up with the other path, around the pond. This area is in the shade of large weeping willow, but still receives a few hours of afternoon sun. I have 1 blueberry bush here, and 5 rhubarb plants. Under the willow is where I have my spring garden. It's filled with spring-flowering bulbs and plants that do well in the weeks before the willow leafs out. In summer, the hostas and lilies take over for small specks of color. The soil in the low garden has been beefed up with a lot of compost, and hence is very rich. It was the site of our first compost pile. For the first 4 years, we added and added material. Now, it's an excellent spot for rhubarb and blueberries. It also receives a good share of afternoon sun each day, for our yard that is (remember, we're in the pacific northwest where trees grow tall). 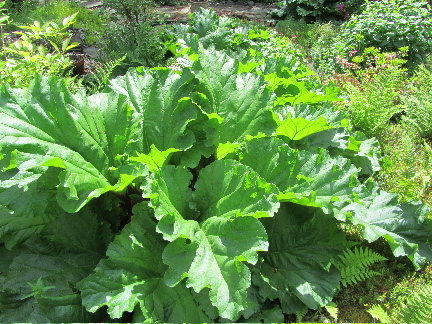 With the rhubarb, I began with 3 plants. I originally planted them near the house. They were quite unhappy there and never did much. When I moved them to the low garden, I also divided them, giving us 6 plants. And when I moved 1 of the plants one more time, I inadvertently divided that one into several small plants, giving us a total of 12 plants. I have since given away 4 of those plants, leaving us with 8 healthy plants. I've got another plant spoken for for the fall, when I can dig them again. I think 6 plants would eventually be an ideal number for our needs. In addition to the rhubarb and blueberries, we have many perennials in the low garden, including day lilies, iris, oriental and asiatic lilies, spring-flowering bulbs, hostas, rhododendron, ferns, azalea, the mints, my tea garden, and an assortment of succulents. Our thought was more tropical looking plants for this area. Unfortunately, slugs like to dine on many of the tropicals, so it's a never ending battle between me and my flowers, and the slugs. I made an addition to the low garden on Tuesday. I added a water lily to the pond. It was on clearance at Home Depot, so we'll see if it grows at all. I mentioned that I've been dehydrating rhubarb. I'll give details on how I do that and what I use this sweetened, dried rhubarb for, tomorrow. We're on about 3/4 of an acre. So, not huge, but bigger than your average city lot. The very back part of our lot is woods, and left as is. I only drew the parts that we've done anything with. I'll get to drawing the large side yard another time. It has the veg garden, berry patches, pumpkin patch and apple trees. Now this is a garden! So exquisite with its sweet wandering paths, lush vegetation, interesting foliage and so much time and care given to the placement of each lovely plant. Thank you. The drawing doesn't indicate this, but the two paths, the one out to the woodland gardens and the one through the low garden, hook up behind the white garden. Lush it is! That's the rainy climate. Most people think of weeds as small little things. To us, ferns are weeds. One week, there's a bare spot. We have a week of rain. The next week I go out and there's a new fern to pull up! I agree with Jemma, your garden is so lush :) I know I've asked this before, but do you plant all of this every spring? Or do some plants survive the snow? The only things I replant each spring are in the vegetable garden and a few annual flowers in pot near the house. Otherwise the rest of this comes back each spring, and a fair amount of it is evergreen. You'd be surprised how much can survive snow! Wow, you really have a gift. Still jealous of your productive rhubarb. If I could send you some rhubarb, I would! But ours didn't always do so well. Where I first planted it, up near the house, it never grew very big or very productive. I think moving it to a richer soil and watering regularly in summer, really helped. It might just also like our cool summers here. When I hear of people having peach trees I become envious. Peaches would be very difficult to grow here. 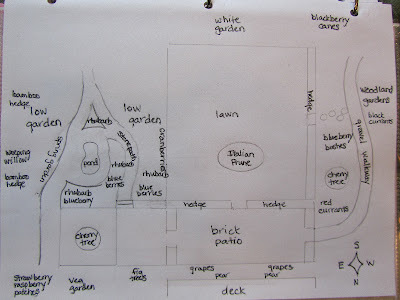 I am moving toward the idea of a planned garden that I can add to each year, and maybe see the effects in 10 years! A benefit of staying put in the same place. I really like your garden design - that it's meant for walking and showing and eating! It does take time, but its also a hobby for us. In winter I enjoy pouring over landscape books and dreaming about areas of the garden. The in spring I get the fun of planting it all. And summer/fall there is the continuing harvest and walks along the paths to see what's in bloom. I enjoy being outdoors, so this is a good hobby for me, as well as provides a large amount of our food. I'm really enjoying your blog - and I was reading down a couple of posts and wondered where in the world you got free vanilla beans? I'm making my own vanilla also - and I only splurged on two beans ($10 at Winco!) for a fifth of vodka! Is that enough vanilla for that much vodka? I'm glad you enjoy my blog. Do you have World Market (used to be called Cost Plus) in your area? It's an import store, along the lines of Pier One, but better prices and a large food section. Anyways, their vanilla beans come in ziploc bags (2 beans per bag) priced at $2.99. World Market has an email list. If you sign up, just before your birthday they email a $10 coupon (no minimum spend). I used my $10 coupon to buy 6 vanilla beans (3 packets). Hmm, I used all 6 of my beans in 2 cups of vodka. Most recipes call for 6 to 8 beans for 2 cups. You may want to use less vodka (if you haven't started already), or add more beans. If you have started yours already, you could just wait and see how you like it in a couple of months. Then add more beans and infuse longer. I will give you a hint about a future post here. I've been planning a post on making vanilla, with a giveaway that could interest you. It's planned for the end of this month. Now I'll pop on over to your blog!